Sorry for the long drought of posts - family life has been very demanding, and tutorials take a lot more time than i realized! I just want to take a moment and say thank you to all the wonderful people who make the effort to put together free tutorials, because i now know it really is EFFORT! Not that many of them will read this post, but i'm putting it out there anyway! And making more efforts to comment on blogs i read, and show my appreciation to them. Since there were so many pics in this tutorial, i made some collages - let me know how you like them! Great? Lame? Easier to follow? More difficult to follow? 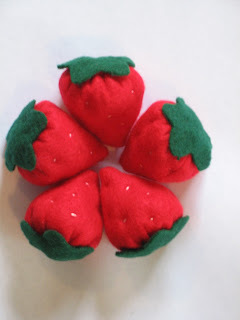 Anyway, here is how you make these adorable berries! 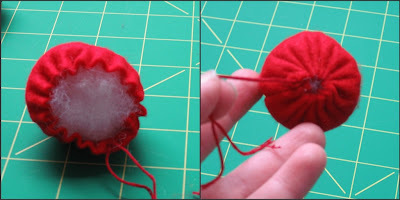 Start by cutting a circle out of red felt. I used a very high tech instrument known as a cereal bowl to trace my circle. It has a diameter of 5 1/2 inches, and produced two 1 1/2 x 2 inch berries - the perfect size, i think. But if you want bigger or smaller, go for it! Then cut the circle in half. 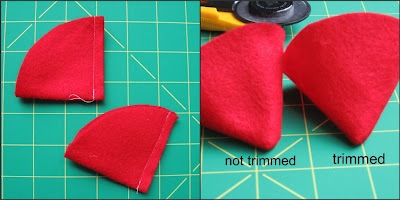 Fold the half-circles and stitch the straight edges together with your sewing machine to create a cone (1/4 inch seam allowance). You may trim the point if you want to, but i preferred to just leave it. I like the end of the berry to be rounder myself, though there's not a HUGE difference, so i just saved myself the extra step. Now turn your berry right side out. Stitch along the edge of the berry (no more than a 1/4 inch from the top), keeping the thread ends to the inside. I used embroidery floss, but you could just as easily use a strong thread if you prefer. Stuff the berry with poly-fill and then tighten the thread ends to close up the top as much as possible. 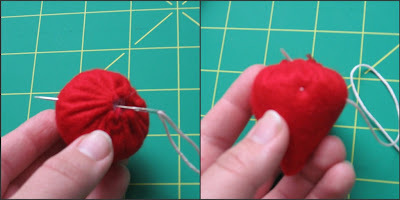 Tie a knot or two and either trim off the excess thread or stuff the ends back inside the berry. I used a pale pink embroidery thread to make the seeds. Tie a knot at the end of your thread. Stick your needle through the hole at the top and out the side. With the distraction of stopping every 30 seconds to take a picture, i forgot that i like to start the seeds at the bottom, but it doesn't make a huge difference where you start, really. There's no need to tie knots (unless you're feeling extra ambitious), just make small stitches around the berry until you're satisfied. Bring the thread back out at the top, catching the edge of the opening. Tie a knot, stick the needle back inside the berry and out the side and trim off the excess thread. Cut out some rounded five-point stars out of your green felt (1 1/2 inches or more from point to point). I was making multiple berries, so i traced a template onto cardstock, since it's hard for me to get a perfect star every time. I didn't care enough to figure out how to stitch the top on so it would look nice, so i just hot glued it on. They stay really well, so i'm sticking with it (no pun intended!). And you're done! Now you can go make a whole bushel! 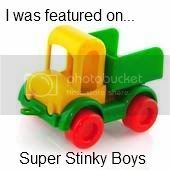 Just found this! A lovely tutorial for me to make as a keyring for a friend!